In some of my articles in the past, I explained how much wealth assets we need to build up, if we are aiming for Financial Security, Financial Independence and Retirement. For example, you may be aiming for Financial Security, where you aim to build up a Wealth Machine that distributes a Wealth Cash Flow that is able to cover your annual survival expenses. If you withdraw 5% of your initial wealth cash flows from your wealth machine, and on an annual basis, your annual survival expenses is $30,000, you will need to build up $30,000/0.05 = $600,000.00 in assets in your wealth machine(s) to attain Financial Security. The financial instruments that you chose to make up your wealth machines will need to keep up with inflation. Thus, we assume that if we predict long term inflation averages 3%/yr, the rate of return of the financial instruments in our wealth machines will need to return 5% + 3% = 8% /yr over the long run. The reality is that there are a few assumptions here and things are more nuanced. The example of the $600,000 worth of financial assets is based on some assumptions. These financial assets are also known to be probability based. Investing in a portfolio of individual stocks. When you invest in a portfolio of individual stocks and actively manage them, the stocks’ performance over time depend on the performance of the underlying business. During recession, or when the business is not managed well, the business earnings gets impacted, and thus the management have less cash flow to declare as dividends. Usually preceding recession is a financial market draw down, which is where the value of the stocks takes a haircut. Less cash flow reduces dividends to be paid out, and a haircut to value of your portfolio has the same effect, where you have to sell more units of stocks to get enough cash flow to spend on your annual expenses. An illustration of sequence of return risk of your wealth machine. 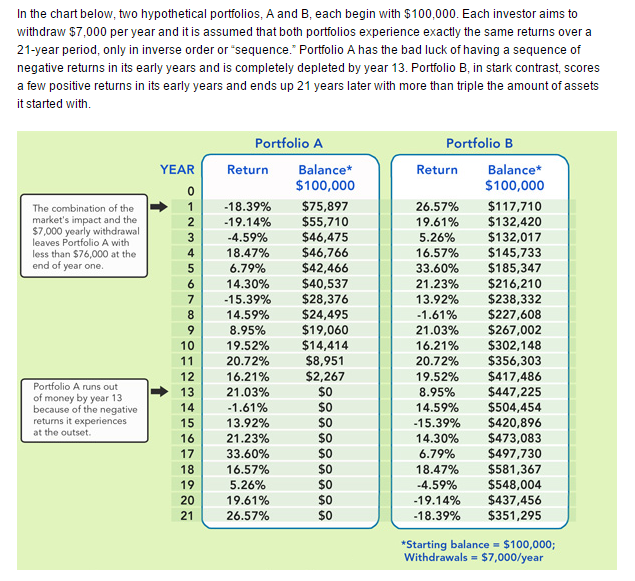 The annual returns are inverted, and with the same withdrawal amount of $7k/yr, A gets depleted early. 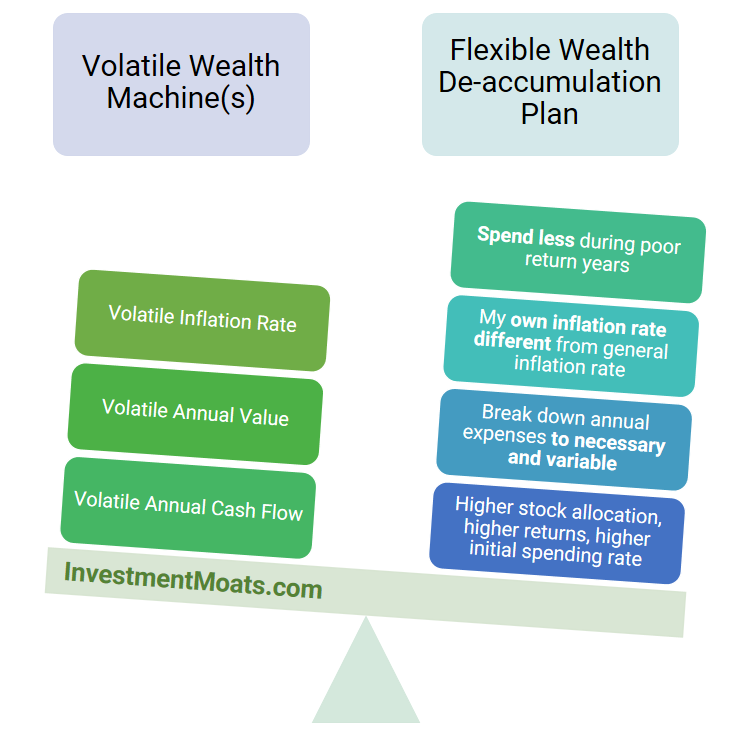 If the wealth builder withdraws too much wealth cash flows (either through spending the dividends or selling off some of the unit of stocks or both), the value of his/her wealth machine may be reduced so much that, he/she risk running out of money much faster. The flip side is that things might not be so bad. The markets might be favorable. REITs, business trusts that are listed, can be classified to have this profile as well. During recession, or mismanagement, the landlord might not be able to rent out the property, or rent at a much lower rate. If you are depending on the rental income for the cash flow to pay for the annual survival expense, you may not be able to pay for all your annual survival expenses. The property value may change, but properties are rather illiquid, so while the value gyrates you cannot sell off partially to get additional cash flow. Investing in a portfolio of equity and bond exchange traded funds or unit trusts. Banks, insurance companies, financial firms have been advising retirees or investors to use a portfolio of stocks and bonds at various combinations for their wealth accumulation and wealth de-accumulation. Investment Linked Policies, Equity linked products, variable annuities can be classified as having similar profile here. And a portfolio made up of bonds and equities can be volatile. The volatility will depend on the combination of stocks to bonds. This is because bonds are less volatile in their value movement on a historical basis. Equities or stocks are traditionally volatile. Thus a combination of these 2 asset classes creates portfolios of different volatile profile. While stocks and bonds exchange traded funds provide a dividend, it is not as much as individual stocks or bonds. Most of the time, the person would have to sell off units of the portfolio to pay for their annual expenses. Thus, the traditional wealth building asset that banks, insurance companies and financial firms recommend can be volatile. Investing in Whole Life Policies that Distributes Cash Flow Annually. In recent times there are specific forms of insurance policies that provide cash flow distributions. We may be more familiar with the Pru-Cash from Prudential that will distribute annual cash back after a few years of contribution. For retirement purpose, there are whole life policies that you cap pay for 5 years or in one lump sum, then it will distribute an annual cash flow. This policy will also grow in value over time, such that should you surrender the policy, you can realize the value. This kind of policy is just like purchasing a property. The investment risk is transferred to the insurer and it can be rather passive. The annual cash flow are usually non-guaranteed. This invites volatility to your annual spending, if you depend exactly on the annual cash flow from these policies for your annual survival expense. From what I reviewed, it is difficult to extract any additional cash flow from the policy should there be a shortfall in the non-guaranteed annual cash flow. But we could perhaps have a line of credit to extract additional cash flow from this. Why do we use financial assets that are more volatile? The main reason is that we do not have enough money. Or that we are trying to reach a certain life milestone faster. We put our money in financial assets that are higher in volatility in the anticipation that they compensate us with higher rate of return. The rate of return is important here. 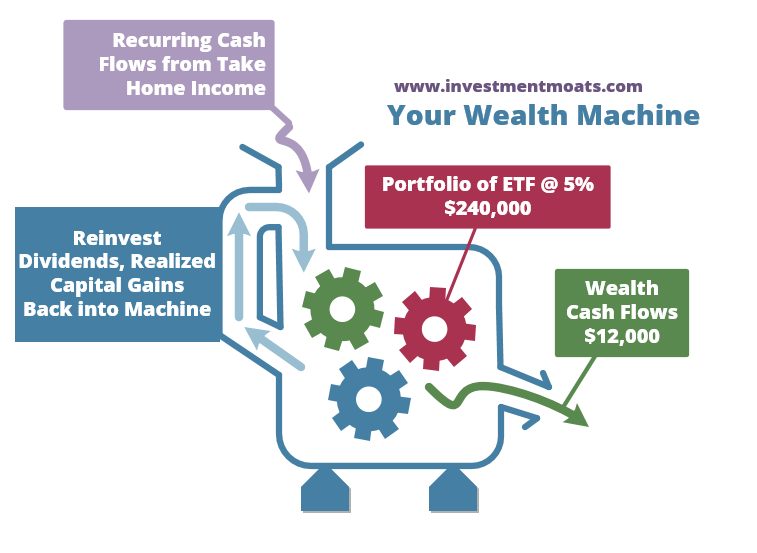 A higher rate of return has the potential of increasing the value of your wealth machine(s). A lower rate of return may mean your wealth machine(s) do not increase in value as fast. This affects how long your wealth machine(s) last. This becomes more important if your wealth machine(s) needs to last long. 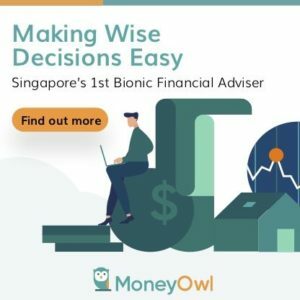 Those who aim to retire or be financially independent and stop working at an early age will need to put their money in higher volatility financial assets to ensure their money last. If not they need more money. The probability based strategies that I covered in the early sections are more volatile. There are strategies that are on the other end of the spectrum that are safety first. Safety first means the strategy ensure the definite spending amount is met. For example, if you need $30,000/yr, you will get $30,000/yr. Bond Laddering. 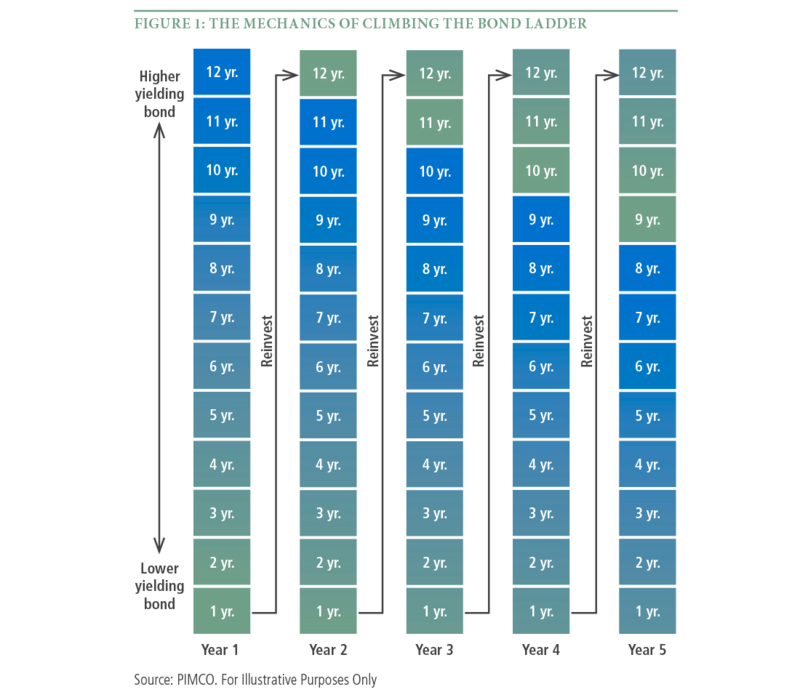 Bond laddering involves splitting your wealth into a portfolio of bonds that mature at different times. So a 10 year bond ladder with $500,000 in wealth assets involves buying 10 x $50,000 worth of bonds that mature every year from year 1 to year 10. When the bonds with 1 year duration mature, it is reinvested in a new 10 year duration bonds. The benefit of a bond ladder is that your interest income yield can shift up and down to better keep up with prevailing inflation. For example, for the next 10 years the inflation is rising, to control inflation, and to attract capital to the bonds, the interest yield on the new bond needs to be higher. When one of your bonds mature, you are reinvesting in rising yield. This helps keep up with inflation and your purchasing power. Suppose it averages 2.3%. If your annual survival expenses is $30,000/yr, you will need $30,000/0.023 = $1.3 mil. Single Premium Immediate Annuity. An annuity is a plan sold by insurance company that pays you an income as long as you are alive. You put in a lump sum, and after x years, they will start paying out the annuity annually. If the assured passed away, depending on the annuity, some annuity will return you a residual amount, but in most cases you will not get anything back. Single premium annuity differs from a lot of the annuity or retirement plans sold by insurance company in that, it is meant more for distribution while most annuities in the market are variable annuities. Variable annuities volatility profile is covered in the more volatile financial assets section. They are usually made up of unit trusts that are expected to grow over time in a non-guaranteed and volatile fashion and the eventual annuity cash flow is non-guaranteed. Immediate annuities typically provides a fixed cash flow that is guaranteed. With this cash flow for life, you can ensure that your planned annual expenses can be covered. The weak part of annuity is that to keep up with inflation, the growth of the pay out a lot of times is non-guaranteed. Your CPF Life is an annuity that is rather similar to this, the only difference is that the payout is not guaranteed in writing. Inflation protected bonds. In some countries, the government released bonds that are index to inflation or the consumer price index. Unfortunately, you need a lot of money. Why don’t we adopt Safety First Strategies thoroughly? The main reason is that you need a lot of money. Most of the yield or rates of returns is low. The bond ladder example gives a good picture. If you earn a good wage such that you can amass a large amount of money, you can embrace any of these strategies. It could also work for you if you have aggressively work and build wealth at the same time to amass a large amount of money. Then, you decide to take a very passive approach to wealth distribution and not actively manage your money so much. This could work for you as well. 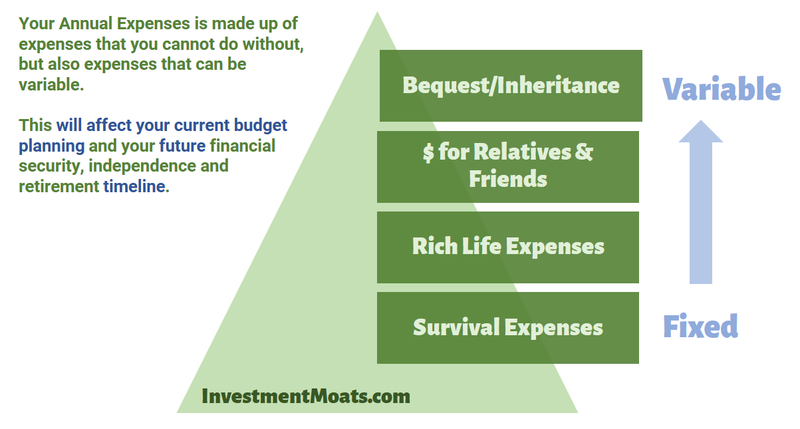 The other side of the equation that if your spending is much less than normal but have done either of the above in earning a lot or building wealth very fast this could work for you. You would have come across articles that states that 4% withdrawal rate is the benchmark. That is the rate of withdrawal you should adopt in order for your money to last. When you are flexible with the assumptions, you can tailor make your plan. I explain more about flexible wealth spending schemes in the variable withdrawal system that makes $500,000 possible. The summary idea is this: if you are flexible in everything, knows all the variables, how to vary each variables, you can make a scarce sum work better than be demoralize and choose a 100% safety first approach. If you put it this way, you can adopt a safety first low volatile approach to satisfy your survival expenses while funding your rich life expenses with a portfolio that is more volatile. If a market drawdown occur your safety first assets provide the capital to spend, while you can minimize your portfolio and not excessively drawing down on your portfolio. You can allocate 100% into stocks to provide more returns. You can have a buffer fund to smooth out a more volatile portfolio. The best way to make a 100% volatile portfolio to work is to withdraw a constant percentage of your wealth machine(s) value. Suppose your portfolio is cut to $500,000 or a 50% fall you withdraw $25,000. Your money will never be depleted. But your annual amount available for spending is very volatile. Again, if you are flexible, you can make a volatile plan work. How much of your Annual Rate of Returns should you Spend? Let us have an example. Suppose you have an idea that the rate of return of a portfolio of stocks 100% invested generates a total return of 7%/yr. You observed that the general inflation rate in the past have been stable at 2%/yr. So your plan is to withdraw 5%/yr of your initial wealth machine(s) value for your expenses. We have shown that as a whole your rate of return will be volatile, if you have limited amount of money, which means some years you are going to earn a negative rate of return and some years a positive one. When your rate of return and wealth machine value is volatile, you cannot spend all of your rate of return as it will deplete the value fast. Then this is augment by the forecast rate of return required to maintain inflation at 2%/yr. In all it adds back to 7%/yr. The general idea is the same, if you understand your expenses, and have a work flow that guides your flexible spending, you can make it work. For my best articles on investing, growing money check out the resourcessection.